In the 1890’s St Paul’s Presbyterian Church with its lofty steeple dominates the Brisbane skyline and was widely known as the ‘Kirk on the Hill’. When the Church was built the street outside was part of Leichhardt Street. In the 1930’s it was renamed St Paul’s Terrace because of the prominence of the Church in that part of Brisbane. St Paul’s is of special significance to the architectural heritage of Brisbane as it is one of the buildings of the Colonial Architect, F.D.G. Stanley. Stanley was also responsible for the Central Post Office, the Queensland Club, the National Bank building in Queen Street (formerly the Queensland National Bank) and the Port Offices. Unexpected boom time in Queensland led to the construction of the new Church at the Spring Hill site. The congregation, had since 1863 worshipped in a wooden Church in Creek Street and had build a handsome stone Church on the Creek Street site only thirteen years earlier in 1876. The 1887 gold discoveries at Gympie, and those at Charters Towers, Ravenswood and the Palmer River in the 1860’s and 1870’s had resulted in a heavy demand by businesses for prime city-centre locations. 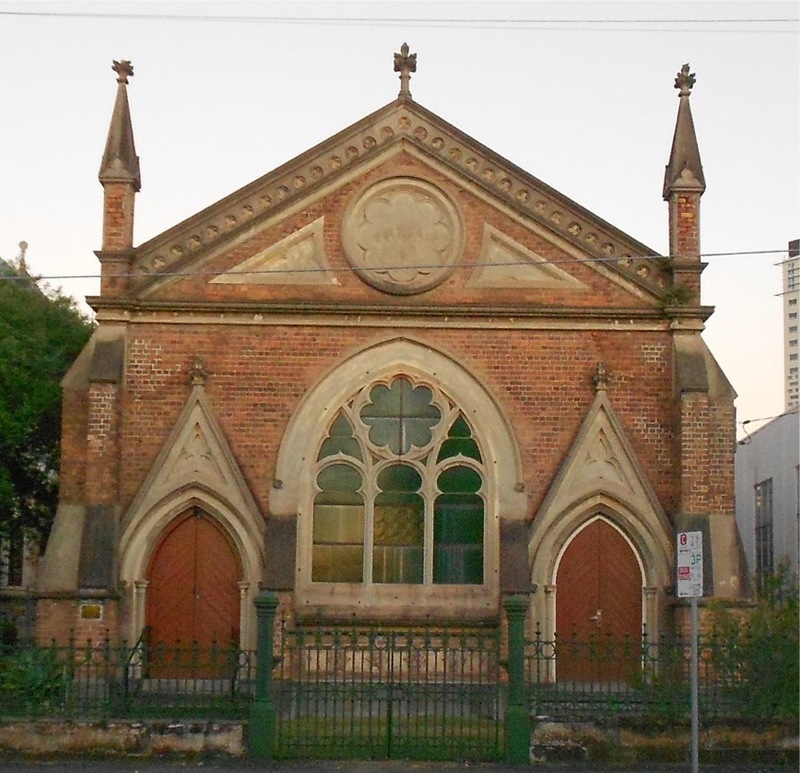 The Creek St Presbyterian Church congregation was persuaded to sell its land in 1885 to the Queensland National Bank for the sum of £18,750. As a result the congregation acquired the Spring Hill property for the relocation of the church, which had been the site of the first Children’s Hospital. Much of the stonework from the demolished Creek Street Church was used in the new building. The foundation stone was laid on the 8th October 1887 by Mrs R.L. Armour the daughter of the first minister, Rev. McGavin. 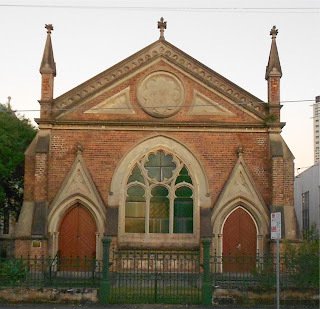 The building was dedicated to worship nineteen months later on 5th May 1889 in a service conducted by Rev. John Ewing of Toorak, Melbourne. The building was erected by Mr T. Rees who was subsequently Mayor of Brisbane and contains much of the original structure in Creek Street. 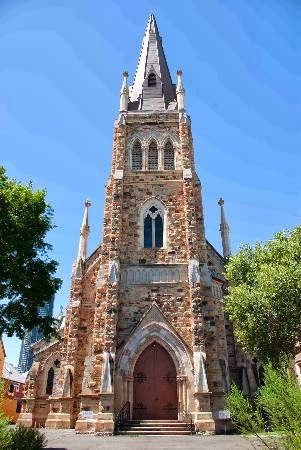 The St Paul's Presbyterian Church building celebrates 125 years since its dedication to worship on 5 May 1889. This impressive gothic-style has special architectural significance as a building designed by F.D.G. Stanley, Queensland’s renowned colonial architect. Stanley designed many historical buildings in Brisbane such as the General Post Office, Port Office, Queensland Club and National Bank building in Queen Street. Admired for it’s architectural beauty, the building is facing the challenge of the years. Subsequent stages will begin as funds are raised. The bell tower project is expected to cost from $1.5 – 2 million and your support will assist us. We need your help! Although donors have continued to contribute generously in support of the Restoration Trust’s project work, the Bell Tower and masonry project will be very expensive. The Trustees rely on the raising of further funding to support the restoration work of the Trust. A receipt will be sent if you email restorestpauls@gmail.com with your name, address, the amount and how you identified your donation. Go to http://www.stpaulspc.org.au/images/restoration_trust_appeal.pdf and complete the linked credit card form. This online site is designed as an 'app' to work on smaller sized smartphones. It will work on tablets and other devices. If you visit the Church each page can be sourced using a QR Code. The QR Code for this site is below. You can use whatever QR Code scanning app you like. We tested all our codes using 'ZIPPY'. ZIPPY can be downloaded from the Apple iTunes Store here. 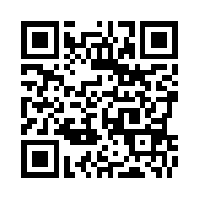 For Android phones we suggest you use QR Droid. QR Droid can be downloaded from Google Play here. The content available in this site has been compiled by Helen Murray in 2013 and 2014 on behalf of the St Paul's Presbyterian Church Committee of Management. This information has been provided in good faith and all efforts have been made to ensure it is true, correct and accurate. However, we understand that despite best efforts, errors and omissions can occur and we are happy to make amendments. ‘A Guide to the Physical Features of the Building’ by Dr Russell Cowie. ‘St Paul’s Presbyterian Church. Brisbane. A History’ by Dr Russell Cowie. When the Church moved from Creek Street the Sunday School had 29 teachers. The Sabbath Hall sits on the former site of the first Children’s Hospital in Brisbane established in March 1878 by Mrs Mary McConnel. To enable the Congregation to move to the new site as quickly as possible, the Sabbath School Hall was built as a first priority. As the hall was not completed at the time the demolition of the Creek Street Church began, the Congregation hired the Protestant Hall in Ann Street for the six week interim. The Hall was completed and occupied as a temporary Church in May 1886 and was used for worship during the construction of the Church building. It is a brick building, in Gothic style, with the side walls and corners articulated with buttresses. A distinctive feature of the building is that the timber panelled ceiling carries five mirror-lined conical light fittings originally designed to throw gas-mantle generated light down to the floor area. In addition to the building’s service as a Sunday School that spans beyond 100 years, it’s most memorable historical episode was the use of it as the venue for the final campaign address by Robert Gordon Menzies on behalf of the Liberal Party for the 1949 election. The house adjoining the Hall had to be demolished as it stood on the site of the proposed Church building. The house on the next allotment named ‘Cora Lynn’ was then acquired as a manse. In 1982 work began with the renovations of the brickwork of the buttresses and walls of the Sunday School hall. In 1983 an honorary architect, Mr John N Blake was appointed and on the basis of his advice further work was commenced on both the Church and the Hall. For the restoration of the hall in early 1984 a new floor was laid, new wiring and power points were installed, plumbing repairs were applied to ensure weather proofing and the interior was painted. With the addition of a set of new easily moveable seats the hall was refurbished as the centre of the Congregation’s social activities. The basic Church structure was executed in porphyry stone and has remained sound. The facings and ornamentations are in sandstone from Goodna and probably Helidon and have suffered significantly from erosion. Some of the stone from the original Church was also used. A restoration appeal has been operative for several years. In 1949, renovations of the 60 year old building commenced as a part of the Church’s Diamond Jubilee celebrations. For article on Trove click here. 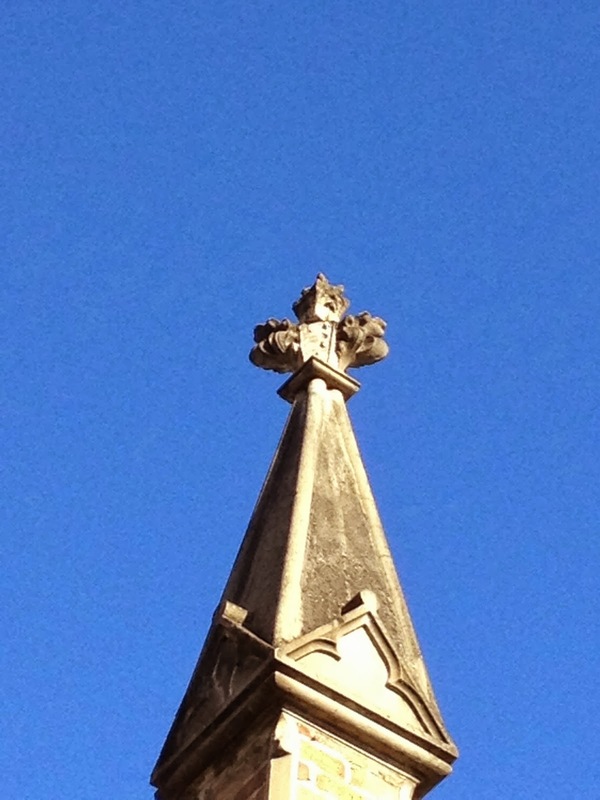 Some of the adornments on the spires and arches of the Church were in an advanced state of weathering and were potentially dangerous. A huge crane was brought into the Church grounds to facilitate the removal of all unsound ornamental stonework. 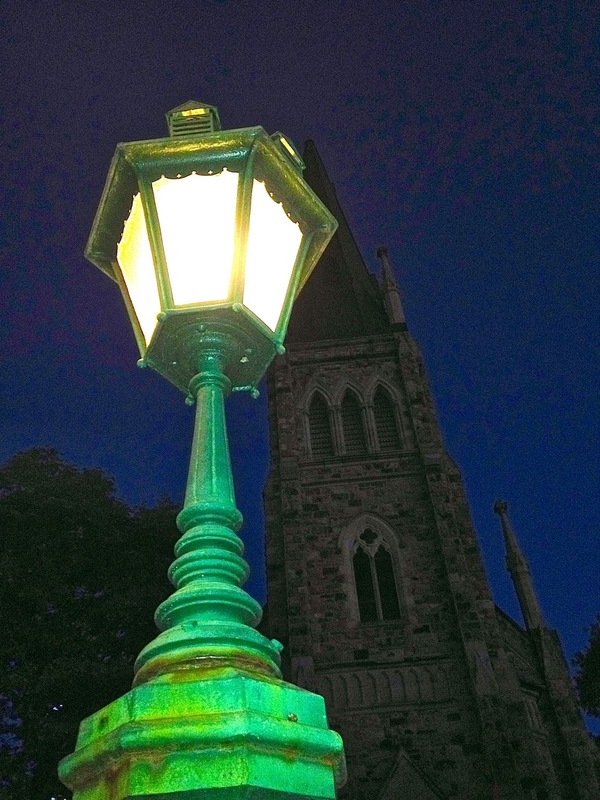 The spire of the Church was examined for possibly only the second time since 1889. It is believed a steeple jack examined the spire in the inter-war period. Under the guidance of the Restoration Trust, the first major project was completed in 1988 with the restoration of the stonework of the arches and surrounds of the front entrance. This was achieved with the help of contributions from the Australian Bicentennial Authority, the Utah Foundation and the “Friends of St Paul’s” Association. In 1993 another stage in the restoration was completed with new roof structures for both the Church and the Hall and restoration of stone copings. In 2006 a further stage was achieved with the cladding of the steeple in copper, the stabilisation of the tower and the restoration of the pinnacles. Credits to major donors are listed on the commemoration plaques in the Church Porch. It is noteworthy that in addition to corporate donations the Congregation itself has contributed generously to the funds of the Restoration Trust. On 21st March 1978 the building was listed by the Australian Heritage Commission as a ‘Registered Place’ in the register of the National Estate, which is defined in the Australian Heritage Commission Act of 1975. The bell in the tower was cast in 1888 by John Warner & Sons (London) as a memorial to Thomas Palmer, who died in 1884 and the electronic chimes system commemorates the life and work of Mr & Mrs R.L. Steward and was dedicated in 1950. 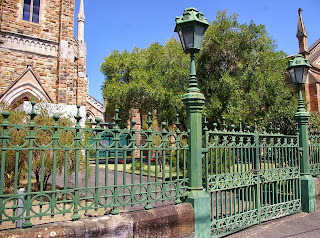 The bell is the only swung bell in Brisbane and the bell chamber is regarded by experts as of perfect architectural design for the transmission of bell sounds into the nave of the Church. One of the major projects being undertaken by the St Paul’s Presbyterian Church Restoration Trust is the restoration of the Bell Tower. The area at the base of the Bell Tower has now been cordoned off by temporary fencing and a gantry erected. Although donors have continued to contribute generously in support of the Restoration Trust’s project work, the Bell Tower and masonry project will be very expensive. The Trustees rely on the raising of further funding to support the restoration work of the Trust. To make a tax deductible donation please go here. 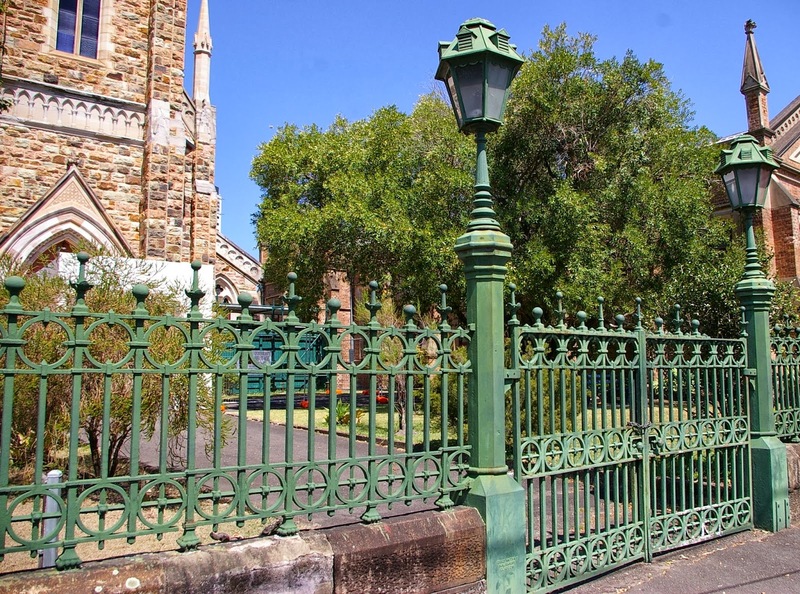 The entry to the Church grounds is through a stone wall and wrought iron railing fence that originally stood outside the older Church building at Creek Street. Close examination of the iron supports of the gates will reveal that a foundry from Glasgow called George Smith & Co made the castings. This foundry was also known as the Sun Foundry. For more information about the foundry go to this page.